I admit – I lose control a bit. I have had a slight obsession with decorating for Christmas since I was a child. Growing up, we would walk into the woods behind our house as a family in search of the perfect Christmas tree. Think the Griswolds, minus the snow. We would even make wreaths out of the trimming of the tree to go around the house. So in the spirit of the holidays, I wanted to show the madness that we go through around the house for the party. 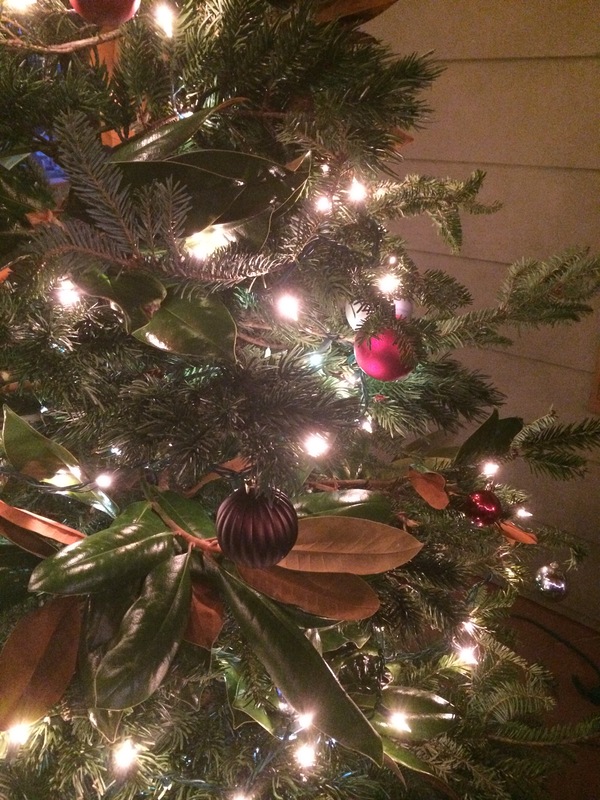 Also, BIG tip here – the Home Depot trims the bottom of the live trees and gives away the greenery that they trim. If you go to the garden section where they are trimming trees, they usually have a large area where they throw the remnants. In Atlanta, they are free – please ask your store before grabbing them, but I’ve found you can take as many as you would like!!!! 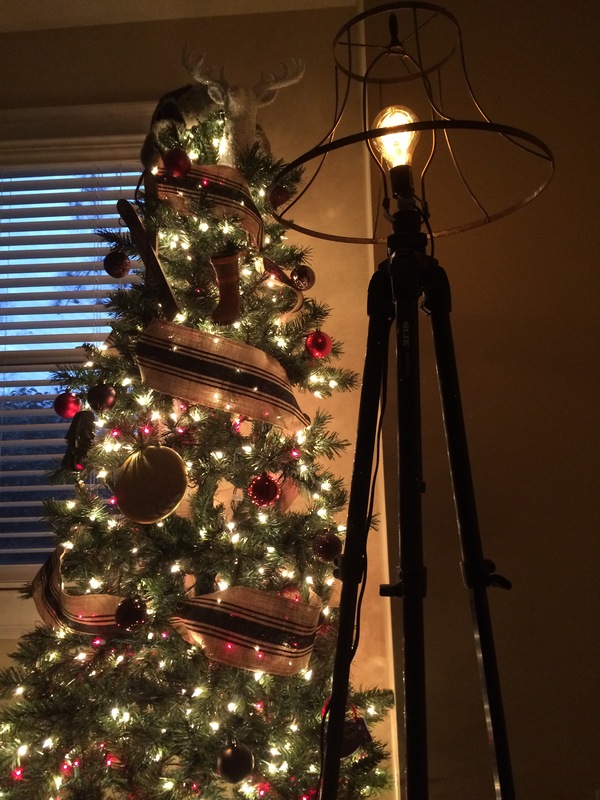 For our live tree, we always use our personal ornaments and a variety of lights. This time we used LED icicle lights that give off a strobe effect, standard mini white lights and C7 colored lights. Add in some personal ornaments, icicle ornaments and an Eiffel Tower tree topper and we were done! Behind our sectional, we have a large wooden console table the we built to fit the sectional (11 feet long). 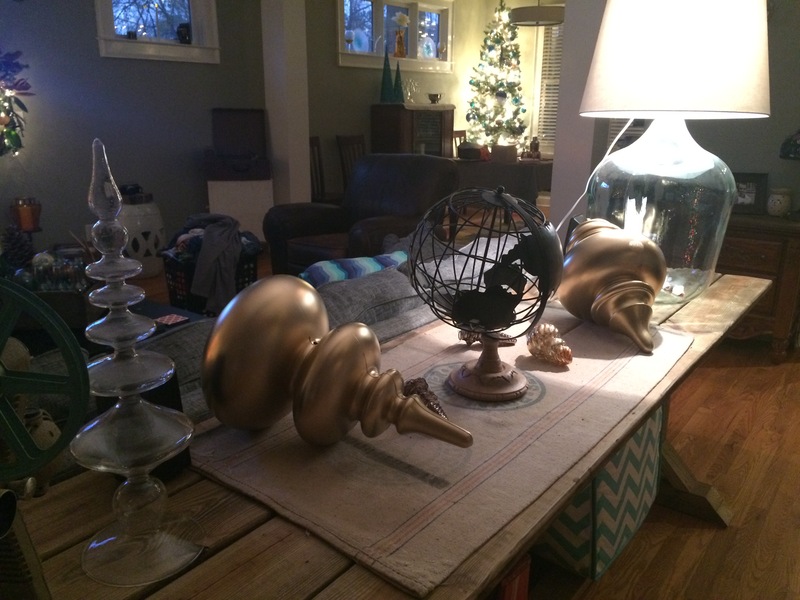 We have a few items on the table already, so I added over-sized ornaments painted gold to add to the holiday spirit! 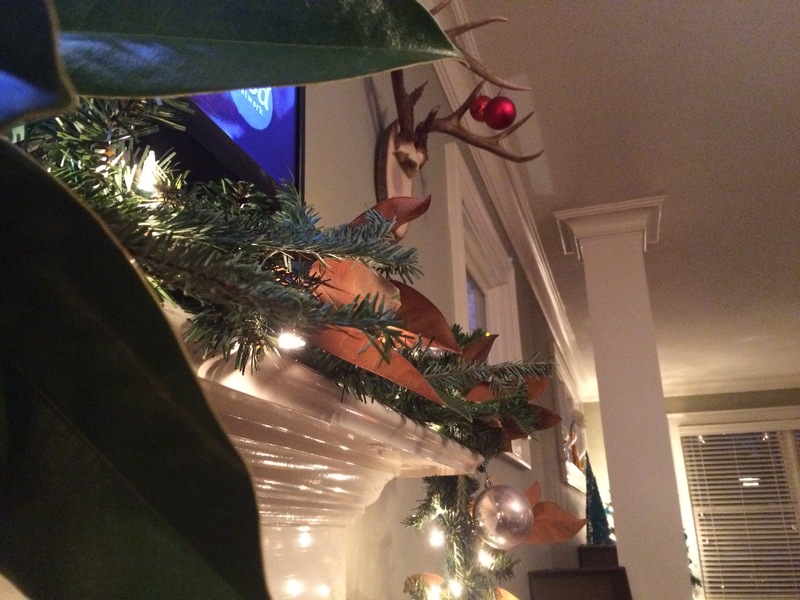 Over the fireplace, we use standard faux garland and usually fluff from there. 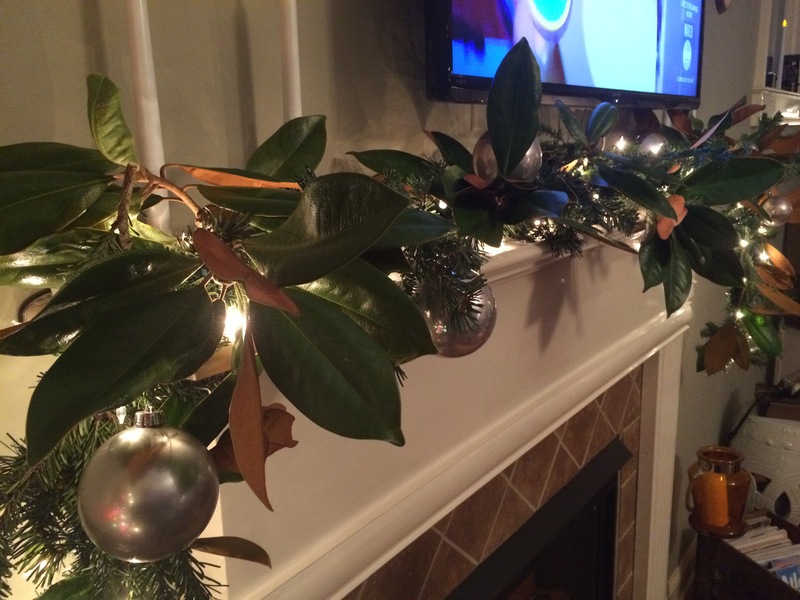 We add mini white lights and add some of the free greenery from Home Depot and some magnolia leaves gathered from Virginia the week before. Add in several sizes of silver bulbs and voila! Flanking the fireplace are two sets of deer antlers – just add a few bulbs from hooks on the antlers for a simple/chic look. 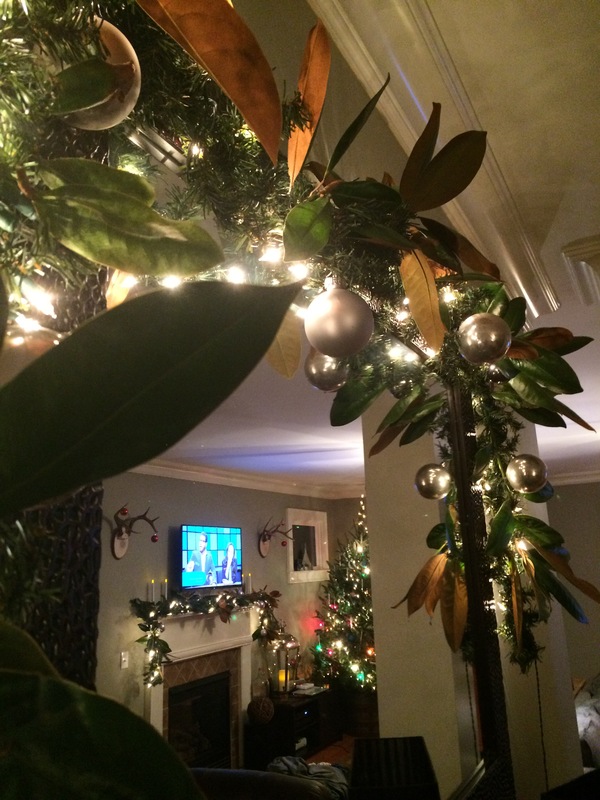 With the same set up as the mantle, we add garland over the mirror in the dining room. 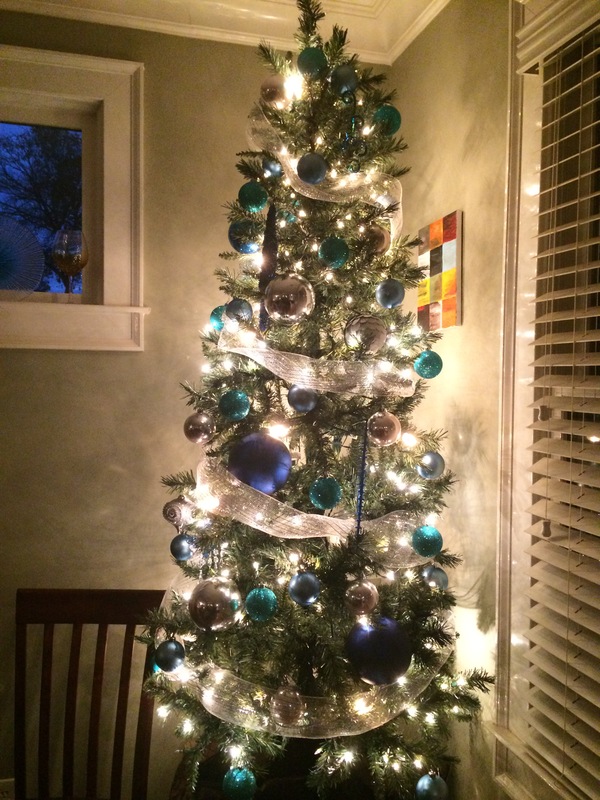 The dining room tree is a pre-lit 7-foot tree and we go with a Hanukkah theme. Blues and silvers abound with mini lights and another set of C7 clear lights. 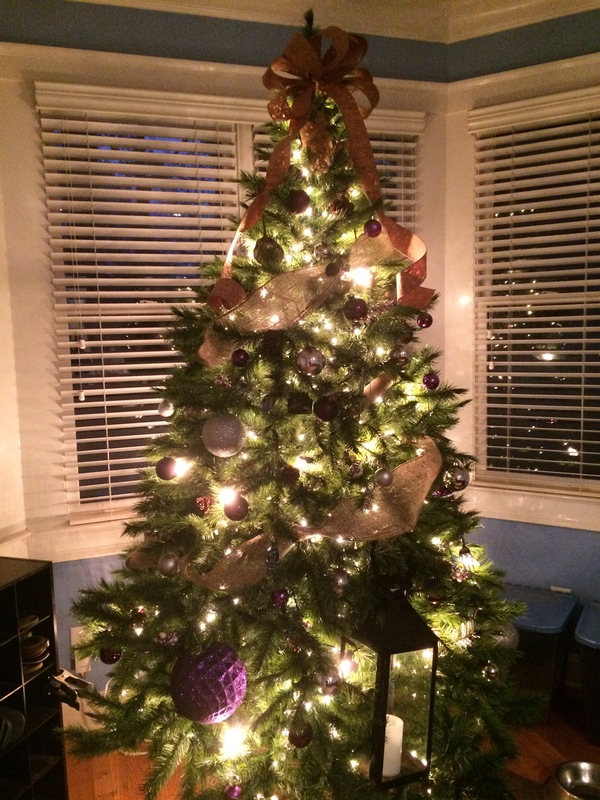 The kitchen tree is a 4-foot tree and has similar ornaments and lights but we added a few wine cork ornaments as well. 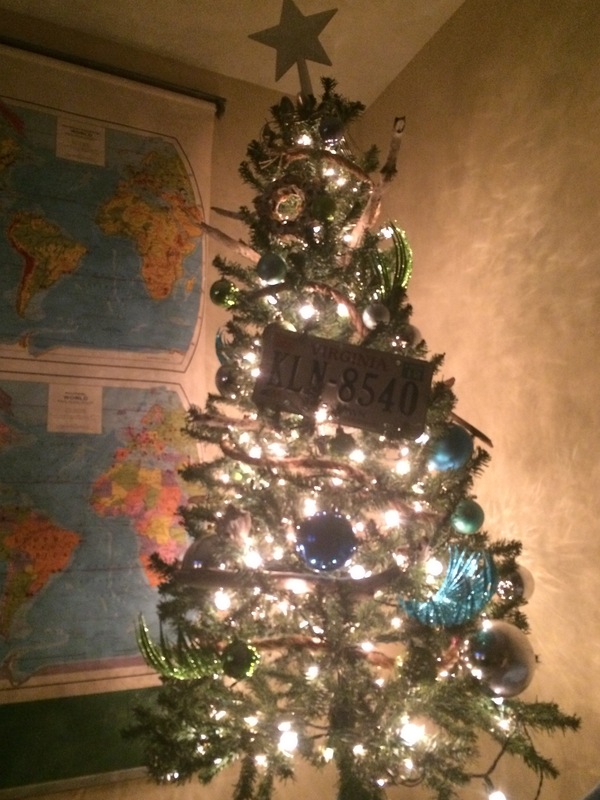 For the office, we always do a Virginia tree to remember our time living there. We use driftwood gathered from the beach in Norfolk, oyster shell ornaments, an old license plate and blue and green ornaments. For garland, we use a natural rope we got at the Home Depot. 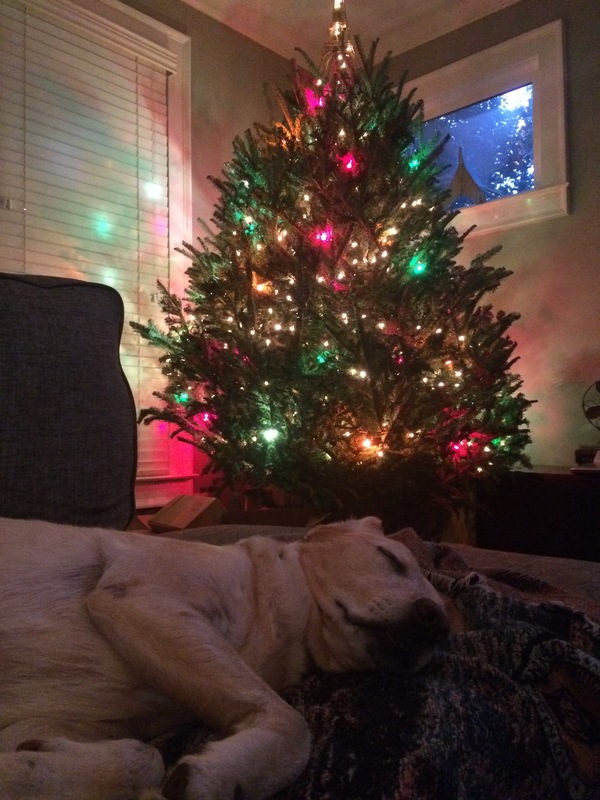 The guest room (aka dog’s room) tree is themed for the dogs. I picked up a few squeeky toys from the Dollar Tree to add to the tree as well as an outdoor winter theme. Wooden snow skis, deer heads and a natural burlap garland rounded out the theme. 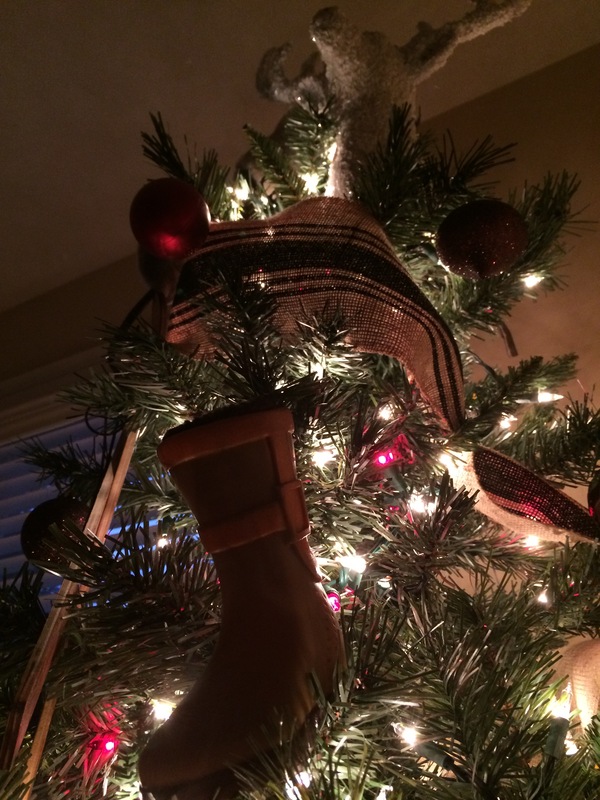 For a tree topper, we used a winter hat. Our bedroom tree is geared toward us and our childhoods. We both grew up with colored mini lights on the tree, so that is what we use. 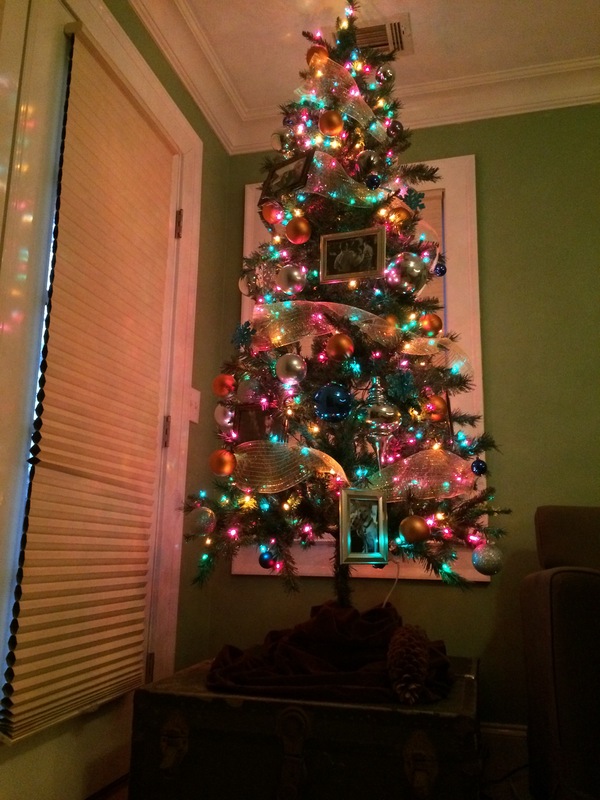 We also use orange, blue and silver ornaments on the tree to match the duvet on the bed. 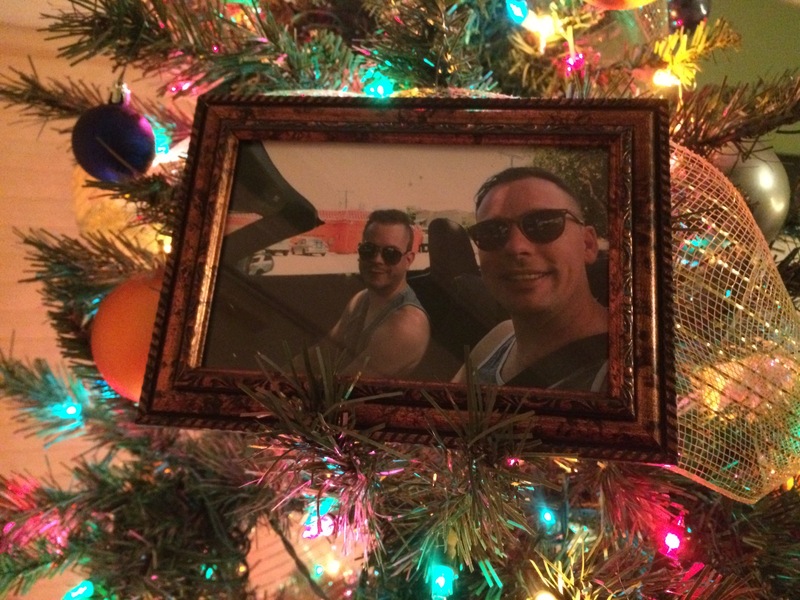 This year, I picked up several 4×6 gold frames from the Dollar Tree and put several photos of us in them scattered around the tree. 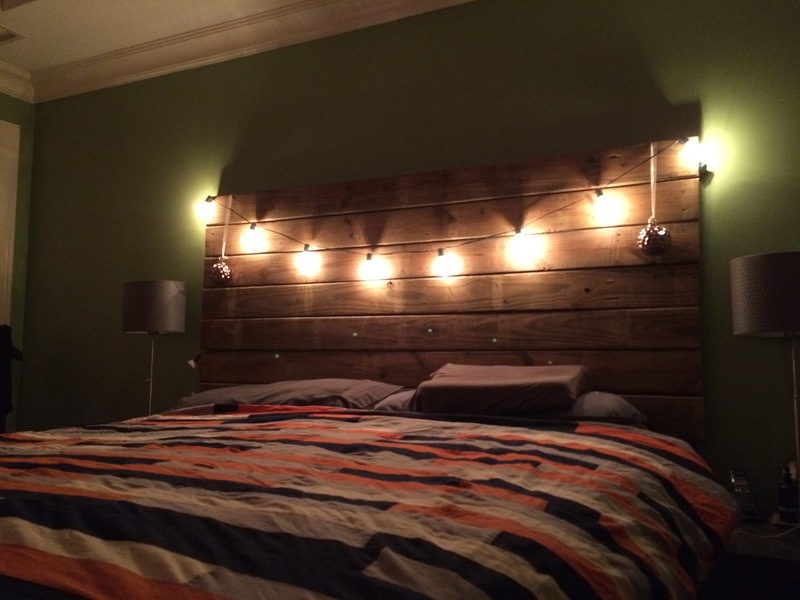 The headboard is one that we made from leftover wood from when a tree limb crashed on our deck. We pulled planks wood from the deck and made a large headboard from it. I just added a string of Edison bulb lights from Target across the top to keep a rustic/modern look. 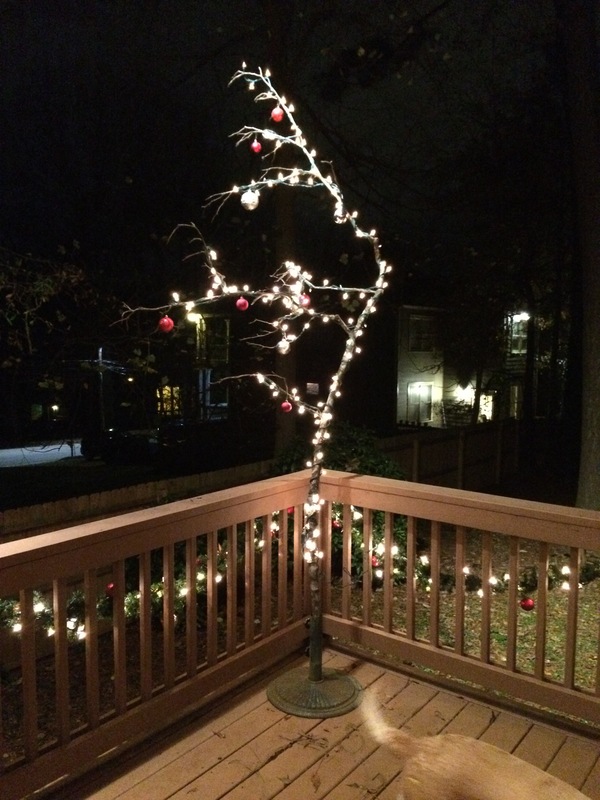 For the back deck, we put up garland around the railing and added a few silver and red bulbs. A few weeks ago a large branch fell from one of our trees in the back yard. Instead of using it for kindling (for now), I added a string of clear lights and put it in an umbrella stand. A few ornaments later, we have a modern/arty/abstract tree! The front porch is layered with garland with mini lights and C7 lights and a few silver and red ornaments. I picked up a tree from the 80’s from a neighbor last year. It is very sparse, like a Charlie Brown tree, so I always stuff magnolia leaves and tree trimmings to fill in the spacing. 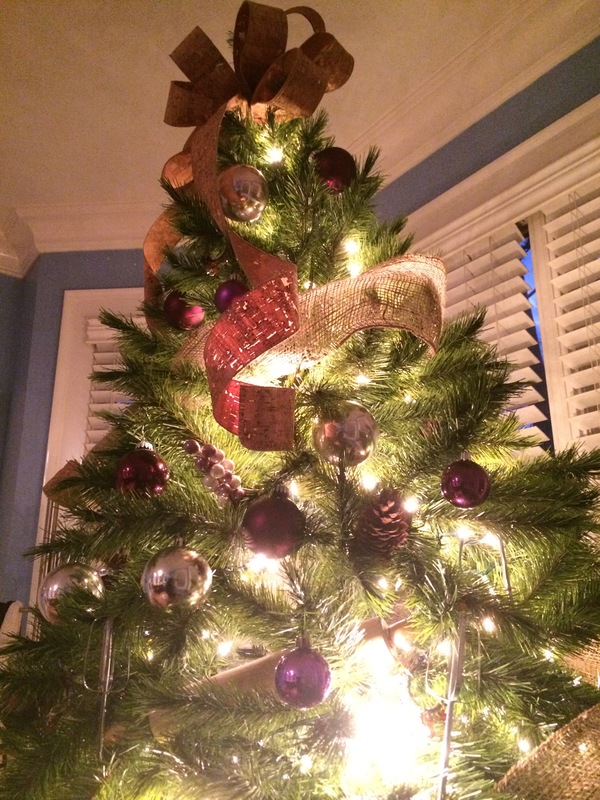 Hopefully you have enjoyed this post about all of our decorations. And hopefully we have inspired you to use everyday items and stuff found around the house to making you decor something that reflects you!